Fragmentation Needed: Cisco 881 or Cisco 881? Cisco 881 or Cisco 881? Part numbers beginning with CISCO881, which have been end of lifed. Part numbers beginning with C881, which are newly available. There are a bunch of differences between these models, but it's hard to tell that a difference even exists, let alone what the differences are by looking at the available documentation. I just got my hands on a new C881 for the first time. Here's what I've noticed. New C881 on top, old CISCO881 (not wireless - don't believe the stickers) on bottom. ...make the ACS-890-RM-19= work on the C881. The USB port has been moved from one side to the other. The "fake" screw hole on the side is now a threaded hole, which means that the C881 will accept the 891's rack mount hardware. The Fa4 port has moved a bit. The C881 is lead free, which seems to be what prompted all of these gyrations. We have a power switch! There's no longer a dedicated PoE brick. There's still a required internal PoE module, and it's got a different part number. C881 ships with 1GB RAM, but half of it is crippled by a license. C881 running c800-universal software image doesn't enforce the advanced IP services license, while a CISCO881 running c880-universal software image does enforce that license. NAME: "881", DESCR: "881 chassis, Hw Serial#: xxxxxxxxxxx, Hw Revision: 1.0"
NAME: "ESW Power Daughter Card", DESCR: "4-Port ESW Power Daughter Card"
NAME: "C881-K9", DESCR: "C881-K9 chassis, Hw Serial#: xxxxxxxxxxx, Hw Revision: 1.0"
NAME: "C881 Mother board on Slot 0", DESCR: "C881 Mother board"
The old 881 won't let me configure BGP, multicast, VRFs without the advipservices license, but the new 881 (or the c800-universal software build) is currently running those features in the lab without any problem. ASR1002 does something similar: the IPSec RTU license on that box lists for US $10,000, but it's not enforced. I don't understand why they've done this. I've not yet tried loading the c800-universal image on an old 881. The C881 comes with twice as much flash (256MB rather than 128MB) as the CISCO881 - It's a good thing because the c800-universal software image is approximately twice the size (80MB) of the c880-universal image. The C881 isn't available bundled with the advipservices license, which would be an annoying hassle if the license were enforced. Matt shares a shot of his C887VAM-K9 for comparison. Lots of missing parts on the C881 appear here. TXH for your great review. You did a great Job ! You need for the POE support a bigger Power Supply with 12V/5A and the POE daughter card. The C881 comes default with a 12V/2,5A Power Supply witch is smaller than the old one. I also can confirm that DMVPN works without the advipservices license !!! Before you needed the 881-SEC-K9 Model. Cisco also added a faster CPU. Now you can use full 100Mbit with Firewall enabled service at CPU Usage 70%. The old Router run with the same Firewall config @ 100% CPU and only 50Mbit throughput. Thanks for this. Could you also post pictures of the motherboards or just an inside view comparing the two? Chris, wow that was fast. Thanks for doing that. I wanted to see the daughter card connector for the switch-ports on both. Chris thanks this as the cisco product page is totally not clear on the differences. The router itself is also not clear on the license / feature it is running, see this output of 'show version'. License Level: advipservices Type: Default. No valid license found. Indeed as you tested all bells and whistles of Advanced IP services function fine on the C881-K9 out of the box. Careful with the IOS versions / old and new 881 / 891. The new c800-universal IOS only works for the new C88x- and C89x- models. For the older models CISCO88x- and CISCO89x- the IOS have the name c880-data-universal and c890-universal. As you can see this is easily mixed up, apologies if this post is confusing - I'm not able to write this more clearly. The best advice I can give is check carefully with 'show version' your current IOS and PID. You cannot load a c800 image into a router that runs c880 but this is easily overlooked. This is an excellent post, I've referred several of my colleagues to this site now. I only wish Cisco themselves would have given such short and detailed overview on this C881/CISCO881 matter, would've saved me a lot of time. Thanks! You may have just saved my job , I almost ordered the wrong routers for the work from home employees....Thank You for a very specific illustration, but Cisco did not explaining this well. Hi All. I scored a brand new C887VAM from a Gumtree ad for $70. I think that she underestimated the value of these things. My "show license feature" command gives me the same result as you show in the C881 example. It is currently running c800-universalk9-mz.SPA.153-3.M3.bin but I have a copy of the latest IOS c800-universalk9-mz.SPA.156-3.M0a.bin. Am I able to upgrade the IOS to this version without upsetting any of the licencing features? I'm assuming the upgrade is done in the same way you would upgrade a Cisco 1841 or similar older router. Don't delete any license files you may find in the flash filesystem. Copying in a new IOS image (.bin) file and changing the 'boot system' configuration directive won't upset the license. How does one contact you? 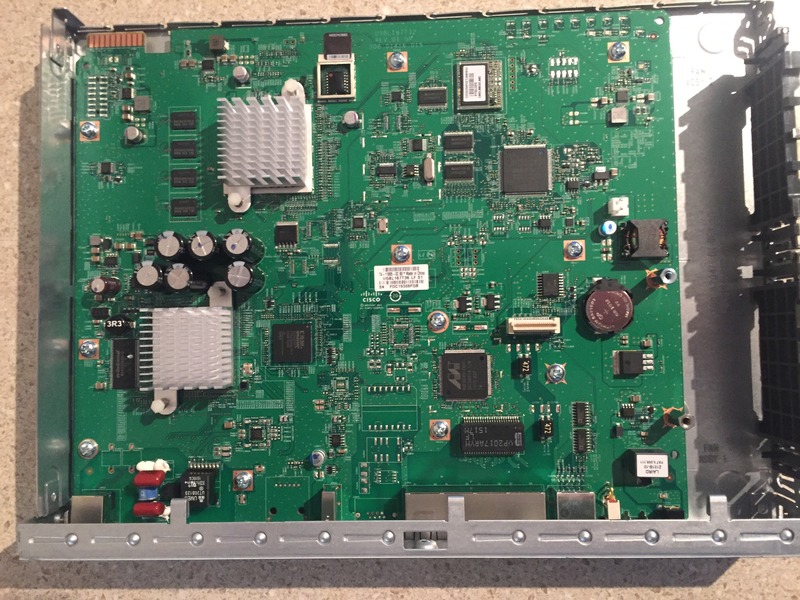 I have a pic of my C887VAM mainboard that is slightly different to yours I'd like to post here. I'd be happy to add your photos here. You can email me using fragmentationneeded@.com, or you can just upload them to imgur (or whatever) and leave a link in the comments here. Are you sure that's the correct email address? Ha! Email address does not look right indeed. I typed something there (inside some "less than" and "greater than" characters), but some HTML layer must have rendered it away. No worries. Having a look at my pictures, I noticed that there is provision for a plug in board at about centre right. Any idea what this might be for? I'm thinking perhaps for a wireless module for the 887VAM-W version. As an aside, do you have any idea what the upgrade licences are worth? I'd be interested in getting the full MEM-8XX-512U1GB upgrade and the advipservices one. I believe that these routers come standard with the advsecurity licence. NAME: "ESWGE Power Daughter Card", DESCR: "4-Port ESWGE Power Daughter Card"